We have been having gorgeous sunny weather here in Southern California!! Gorgeous enough for a beautiful light refreshing salad. I don't know about you, but I can't seem to eat all the heavy winter comfort foods when it's a delightful 70 degrees out. I would much rather munch on delicate greens. After seeing this gorgeous salad from Cannelle et Vanille it gave me the inspiration for my pear salad. I just love fresh ingredients! 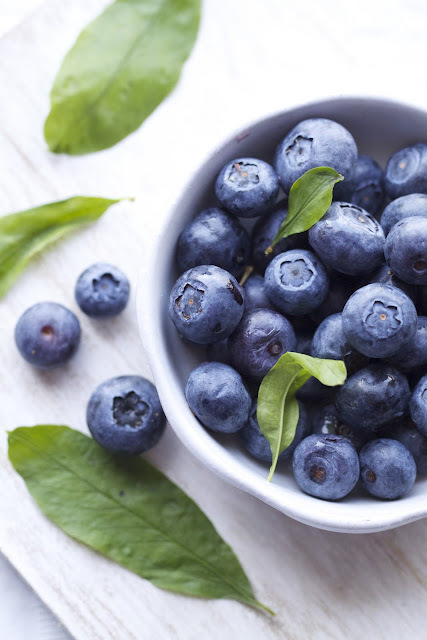 Since it is still winter and blueberries may be hard to come by for some, this salad would be wonderful with all fruits! 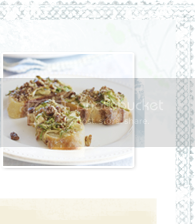 Or even spiced up with candied walnuts and gorgonzola. I tend to throw nuts into most of my salads for a protein boost! Combine pom juice and sugar in a medium saucepan, stir. Over medium heat bring juice to a boil, lower heat to a simmer and add the whole pears. Simmer the pears for about 10-15 minutes. Turn pears and simmer for an additional 10-12 minutes, until tender and easy to pierce with a fork. Let cool in the pom juice for 10 minutes then remove and let cool completely. Once cool cut into 1/4-inch rounds, set aside. Once pears are removed turn heat to medium and bring to a boil. Boil pom juice mixture until thickened, syrupy and reduced by half (stirring occasionally.) It should take about 10 minutes. Remove from heat and let cool completely. Lay arugula over bottom of plate, top with apple and poached pear. 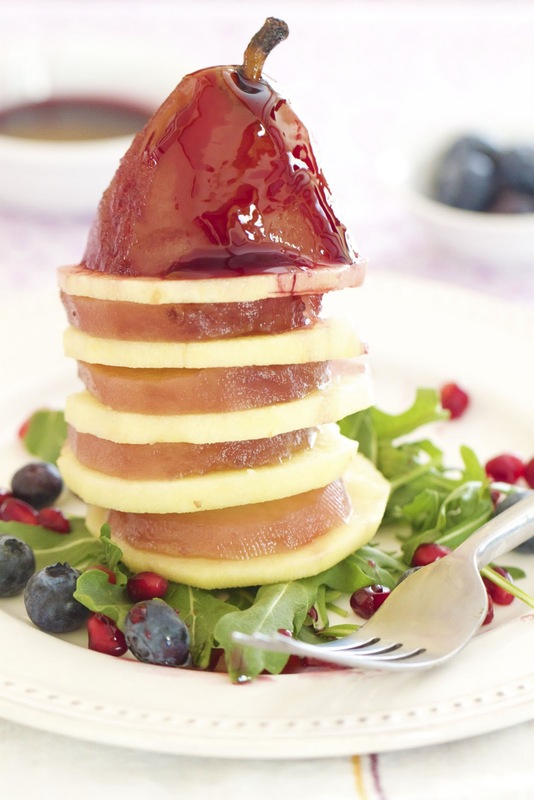 Drizzle pomegranate reduction over the top and sprinkle with desired garnishes. Repeat with remaining plates. Serve and Enjoy! What a gorgeous salad! I love the layers and the pom reduction sounds divine. Such a gorgeous salad! And I love all the flavors you have going on. What a pretty first course this would make for a dinner party! We have had great weather here in Colorado this winter as well, it really does make it hard to eat stews and other comfort foods! This salad looks gorgeous! I have a giveaway going on you might be interested in! This is gorgeous. Great combination of fruits. It looks so delicious! Splendid! 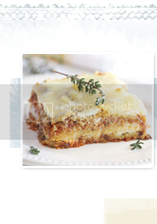 What an original recipe and a gorgeous presentation. What a gorgeous salad Katie!!! I love the look of that sticky pear!! Yum! 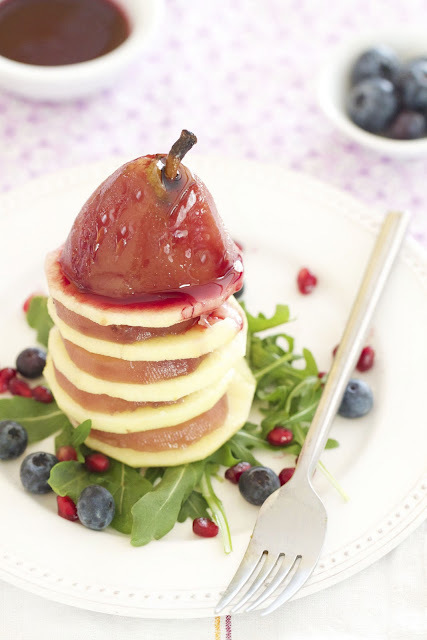 Gorgeous photos and what a great use of pomegranate in this recipe :) Love poached pears. It's just so tasty!! What a gorgeous salad! The weather has been lovely and this is a perfect refreshing treat! Such a nice presentation and beautiful colors! Hi Katie, I'm so jealous of your perfect weather. We are freezing in Europe! But even with the cold weather I crave light salads like yours. Thanks for sharing, it looks amazing! Katie how do you always make food look so pretty. This is stunning.